There's nothing like hearing live music playing in a park on a weekend -- and bluegrass is well-suited to such an event. The Bluegrass Hawaii Traditional & Bluegrass Music Society will once again host its "Pickin' in the Park" jam session from 1 to 5 p.m. Sunday in Moiliili's Old Stadium Park. While listeners are always welcome, the society is looking for those who play acoustic, traditional instruments and are versed in not only folk and bluegrass, but Hawaiian, Celtic and Irish music as well. So bring out your blankets and lawnchairs, sit a spell and enjoy some homespun music. Call 621-9049 for more info. Ala Moana: He's across from Centerstage on the street level until Dec. 24. The Candy Cane Train offers rides through Jan. 1. The station is on the mall level, and the train leaves every 20 minutes. Cost is $6. Call 955-9517. Kahala Mall: Santa arrives at 10 a.m. Friday escorted by hula dancers and Christmas carolers. He'll be at his post through Dec. 24. Through Dec. 15, drop off letters to Santa at a mailbox between KB Toys and Thinker Toys, and get a personalized reply from Santa's Workshop. Call 732-7736. Pearlridge Center: Santa shows up at 9 a.m. Friday at Downtown Center Court. He'll be there through Dec. 24. The Pearlridge Express train offers rides starting at 10 a.m. daily through Jan. 1. Call 488-0981. Koko Marina Center: Santa arrives by speedboat at noon Saturday. Photos are free. Before that, catch the Keiki Kalikimaka parade, starting at 10 a.m. on Lunalilo Home Road from Hawaii Kai Drive to the shopping center. Call 395-3384. If ukulele maestro Jake Shimabukuro were a comic-book hero, he'd be The Flash, not just because of his lightning speed but because he seems to be everywhere simultaneously. This Friday and Saturday, he slows down from warp speed and sits in with the Honolulu Symphony Pops at Blaisdell Concert Hall. Sitting in will be additional Jedi masters of the uke Byron Yasui (who's been on the stage before as a double bassist) and Benny Chong. Jake's bandmates Dean Taba and Noel Okimoto will also be there to feature works from Shimabukuro's latest recording, "Gently Weeps." This is Shimabukuro's first time with the Pops as a headliner, but, hey, he's also played Los Angeles' House of Blues, Tipitina's in New Orleans and The Fuji Rock Festival in Japan, and he's toured with Jimmy Buffett and wowed Conan O'Brien, so, chances are, he can handle a "rowdy" Honolulu Symphony crowd. Looking for those one-of-a-kind gifts? The 25th Annual World Art Bazaar features handcrafted items, folk art, ethnic fashions, jewelry and ornaments from around the world. Among the items for sale are masks from Nepal, antique Chinese baskets, fanciful carved and hand-painted animals from Mexico, African beads, hand-woven textiles from Indonesia, ethnic jewelry, Siberian birch bark boxes and bronze Hindu and Buddhist deities. The bazaar begins Saturday but if you're still too full to move from Thanksgiving dinner, you'll have until Dec. 10 to shop. Bring your checkbook to the Academy Art Center, 10 a.m. to 4:30 p.m. Tuesdays to Saturdays and 10 a.m. to 5 p.m. Sundays. Proceeds benefit academy programs. For information, call 532-8700. Fast food meets "fresh casual" at Moe's Southwest Grill, where they've poached burger joints' "have-it-your-way" philosophy and applied it to Southwestern (via Atlanta) cuisine. Think Subway gone Tex/Mex. Stand in line and choose your ingredients and they build your meal before your eyes. It's a little rougher in execution, with so many decisions to be made. Ordering can be tricky until you get the hang of it, and forget about sending one person up to order for a large party. There are so many options you're bound to forget who can't eat jalapeños, who hates cilantro, who won't eat onions before a date, etc., etc. Don't get too hung up on the names because there's not much variety among dishes. All you need to know is whether you want a burrito ($5.79 to $6.99), taco ($1.99 to $3.39), quesadilla ($3.69 to $5.99), fajita ($7.99 to $8.99) or nachos ($4.79 to $6.29). Just remember a higher price gets you more toppings. The last option on each list is vegetarian, but if you're not going this route, you will be asked to make a meat selection from kalua pig, fish, steak and chicken. Next, choose toppings of pinto or black beans, shredded cheese, pico de gallo, sour cream, cucumbers, guacamole, jalapeños, green peppers, onions, cilantro and various salsas from a salsa bar. Kids' menu available. Open 10 a.m. to 10 p.m. Mondays through Sundays. Meals for two run about $15 to $20. 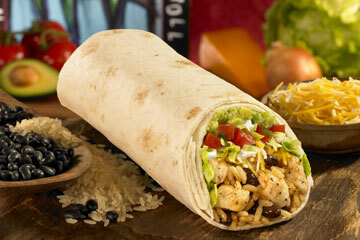 At Moe's Southwest Grill, diners choose their ingredients and have their meal built before their eyes. Can't say enough about your home sweet home? Have you made changes that you're proud of -- or are you just thinking about renovations? Tell it all to HGTV. The cast and crew of the new prime-time show "My House is Worth What?" are coming to town in late January, and producers are seeking engaging owners of condos and houses for a one-day shoot in the Honolulu area. If you're chosen, you'll get an on-air evaluation of your home's worth from experts and tips for increasing its value. Applicants must live within 30 minutes of Honolulu, and be at least 18 years of age. You'll need to submit pictures of yourself and your home. For information or an application, contact segment producer Michelle Boland at Michelle_Boland@pietown.tv or fill out an online application at www.pietown.tv/shows/myHouseIsWorthWhat.html.